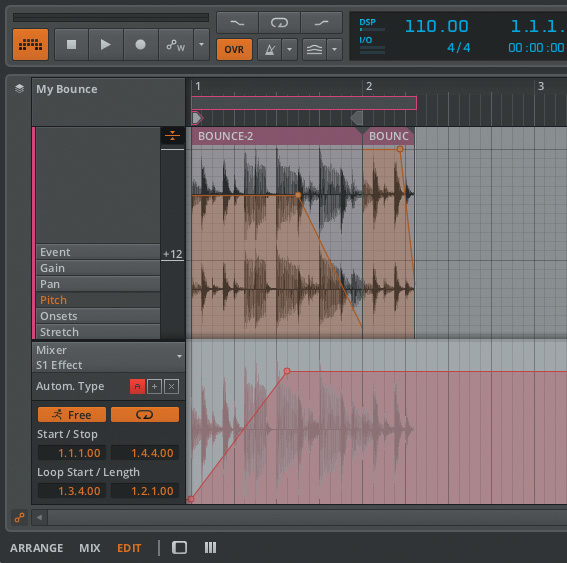 Is Bitwig Studio's fresh take on clip-based music production different enough to tempt users away from established rivals? 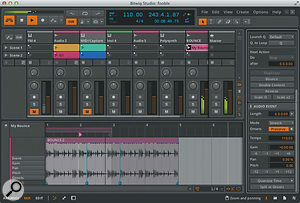 Bitwig Studio is the first, and the flagship, product of Bitwig GmbH, a small music software house based in Berlin and founded by ex-Ableton engineers. It's a new digital audio workstation, and so joins a crowded market. Many of its rivals have been around in some form for decades, and have large numbers of devoted users, so a newcomer is going to have to come up with something pretty special to build a user base and community from a standing start. 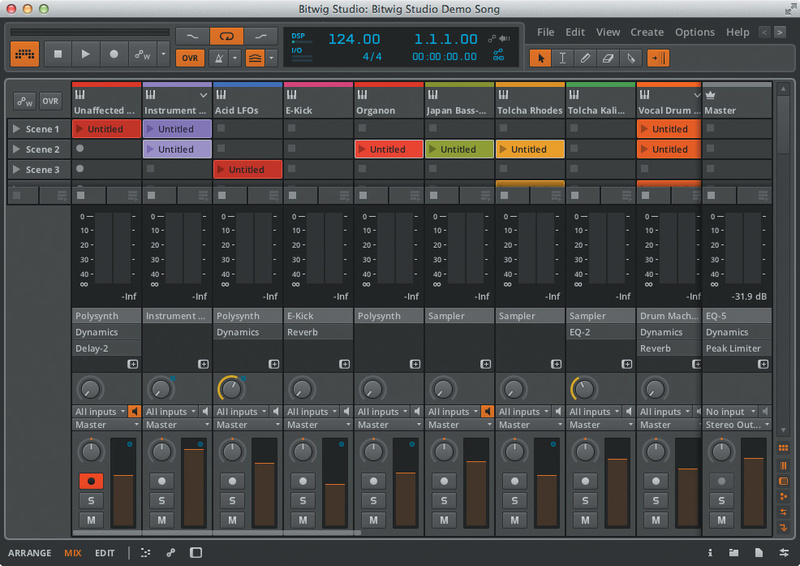 A first glance at Bitwig Studio reveals some startling similarities with Ableton Live: a window with docked editing panels, a 'session' view with launchable audio clips, tracks with horizontal chains of devices, and so on. I could probably fill this entire review with a list of Bitwig Studio features that seem inspired by counterparts in Ableton Live, but in the end that's not very productive; it makes more sense to treat Live's general structure and workflow as a starting point for a particular approach to audio recording and performance, and see what Bitwig does that might be new, different and compelling. I'm going to assume some knowledge of Ableton Live in this review, since I suspect most potential Bitwig Studio buyers are either existing Ableton customers, or will be evaluating Bitwig Studio and Live as alternatives. It should be born in mind that Live is now at version 9, and has the advantage of a pretty huge head start, with a vibrant third-party ecosystem of instruments and sounds, the Max For Live development environment, and a slick, well-engineered and tightly integrated hardware controller in the form of Push. 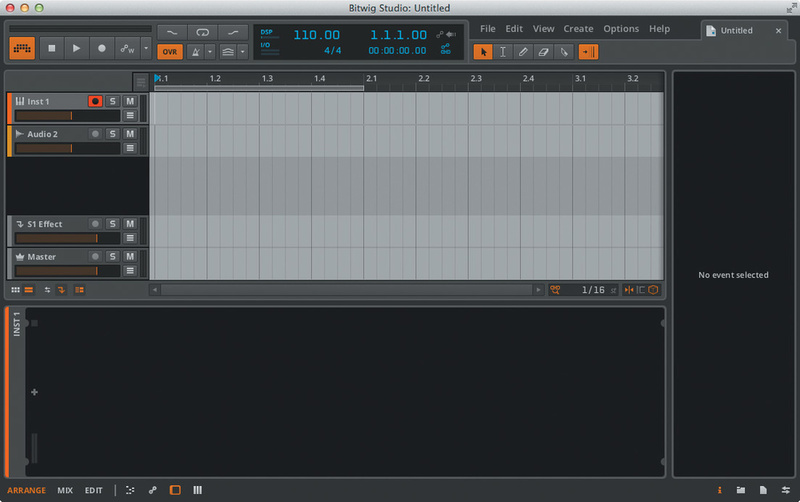 However, there are some fundamental (and interesting) differences between the two products, and ultimately it's up to you to judge whether Bitwig Studio has the potential to make up for lost time. I tested Bitwig Studio (which, for the sake of brevity, I'll just call 'Bitwig' from now on) on an Apple MacBook, but there are also versions for Windows and, curiously, Linux. While I can't imagine the Linux port appealing to a huge potential customer base at this stage, it does offer the prospect of a dedicated DAW workstation without the cost overhead associated with the Mac, or the complexity of Windows. The installation and setup procedure is pretty straightforward. As part of the installation, you're prompted to select which of the content packs should be downloaded and installed, or alternatively installed from a physical DVD. At any time, Bitwig can go online and install additional packs. At first glance, Bitwig resembles pretty much every other DAW on the planet. There are the usual transport controls along the top, together with some menus and editing icons. The system menu bar is almost empty, as Bitwig has its own menu system. The top right of the window has a tab for the newly created project file, of which more later. The centre area of the window is occupied by a familiar-looking horizontal track view which, as you might guess, displays notes on a piano roll, or audio in waveforms, depending on each track's contents. The lower panel area we'll look at shortly. Kicking off: an empty Bitwig Studio Arrange Layout.The window and panel layout scheme is rather complex, so it's deserving of a little explanation. At the very top level, the application has a number of mutually exclusive built-in display profiles. Each of these is designed to address a particular screen layout — including multi-screen systems — and a particular phase of the production process. Thus, 'Single Display (Small)' might suit a laptop-based stage recording or backing task, while 'Dual Display (Arranger/Mixer)' suggests a studio production session. There's even a triple-screen profile for those big Hollywood soundtrack projects. Each profile brings up a set of windows with predefined panel setups. Once the profile is chosen, you can switch between panel layouts. Profiles generally have multiple layouts, indicated by text labels to the bottom left of each window. In the starting session, the layouts are Arrange, Mix and Edit. You click a label, or press the Tab key, to switch layout. In the starting session, Tab flips between Arrange and Mix, bringing up layouts looking very like Ableton Live's Arrangement and Session views respectively. Within a layout, the panel positions are predefined (or, as the manual puts it, 'curated'), but the side and bottom panel areas can usually switch to show different content, or be hidden completely to make more space for the central top display area. Wherever there's a choice of panel content, a group of icon buttons is provided to switch between the alternatives. 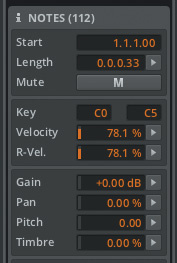 Part of the Mixer Panel, one of the possible lower panels in the Arrange Panel Layout in a Single Display Profile.Apart from one or two special sub-panel displays, everything you can see in Bitwig is shown using this scheme. The behaviour is initially a little bewildering, especially since you can frequently end up seeing the same information in multiple panels at the same time, but there is a clear logic to it. Bitwig's recording, arranging and playback system will be pretty familiar to users of other DAWs, so I'm not going to dwell on the details of recording, monitoring, soloing and so on. Comparing it to Live specifically, the linear arrangement view is currently missing a few features. While tempo automation is supported, there's no minute/second time ruler, and support for time-signature changes is also missing. There's also no dedicated fade or crossfade editing of clips at the arrangement level. One feature that is slightly curious is the categorisation of tracks: leaving aside the usual master and effects returns, Bitwig believes in instrument and audio tracks, which seems sensible, but at this stage it's worth another quick comparison with Ableton Live, which has MIDI and audio tracks. Live is very prescriptive about what its tracks can contain: MIDI tracks contain MIDI, audio tracks contain audio, and each track outputs its own type of content, unless there's an instrument device in a MIDI track, which transforms incoming MIDI into audio. Bitwig's tracks always output audio — there's no concept of a MIDI-only track — so its two track types are distinguished by their input and content. Just to keep things interesting, Bitwig also supports what it calls 'hybrid' tracks, which can record and store a mixture of MIDI and audio. The lack of MIDI-only track support means that it's not possible to address multitimbral VST plug-ins on multiple MIDI channels, as the required MIDI routing isn't available. As in Live, everything recorded in Bitwig, with the exception of overall linear automation, is stored in clips, which can live in what Bitwig calls its Arranger Timeline, or in a non-linear Launcher area corresponding to Live's Session. Each track can be playing a clip from the Arranger, or from the Launcher, but not both at the same time. While Live generally considers its Session and Arrangement to be equally important, but mutually exclusive, views, in Bitwig the Arranger Panel or the Mixer Panel dominates visually, and in each case, the Launcher is a sub-panel. In the screenshot at the start of this review, the Launcher is visible as a left-hand sub-panel of the Arranger Panel. It can be resized horizontally, and can also take over the entire panel for a Launcher-only display. For Live users this view is perhaps a little disconcerting: the 'Session' clips for a track are laid out horizontally, while the scenes form columns, launchable via buttons at the top. For a more familiar perspective, the Mix Panel Layout supports a full-window mixer where we can bring in a Launcher sub-panel at the top. The Mix Panel Layout, with a big-screen mixer showing Launcher clips (and devices). The 'arrangement with launcher' view, although unfamiliar, is the most useful if you're working with a combination of Arranger and Launcher clips, since the state of both sets of clips is visible at the same time, showing the state and internal playback position of Launcher clips, as well as the global Arranger timeline. This is especially useful if you want to record Launcher clips into the Arranger, or just drag clips between the two. Bitwig uses the term 'project' to refer to a main sequence document plus associated audio files. Create a new project, and you get a dedicated directory for the document, with sub-directories for sample files, recorded audio and other book-keeping information. Audio assets from the Bitwig package library, or elsewhere, can be 'collected' into the appropriate project sub-directory for convenience. The cosmetic similarities to Live led me to assume — wrongly, as it turns out — that Bitwig's project management worked in a similar way. In Live, a 'project' is a directory containing several individual Live 'sets' sharing audio and preset assets; these multiple sets can be used to store different versions of a song, or as holders for bounced recordings, and so on, and all files can be managed as a unit. By contrast, Bitwig only believes in projects individually. Try to collect library samples into two projects in the same directory, for instance, and you'll end up with duplicate copies. One consequence is that it's not possible to store multiple versions of a song without making copies of all the audio. 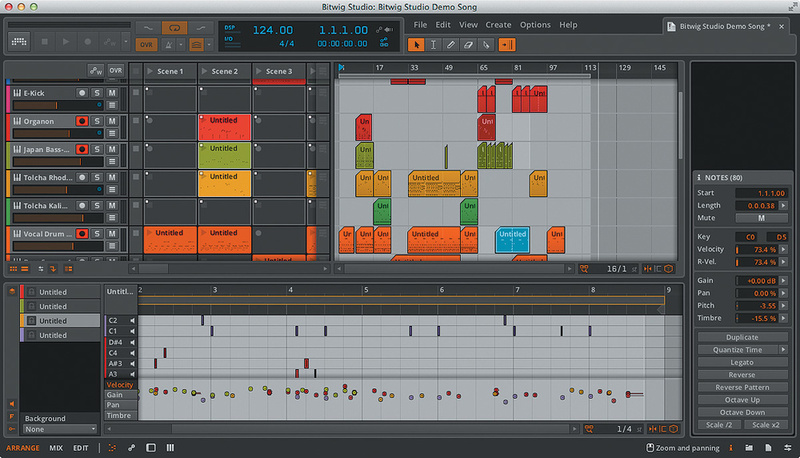 To make up for it, though, Bitwig lets you have multiple projects open and loaded at the same time. You can drag and drop material between them, and so long as you remember to 'collect' files in each one you should be fine. 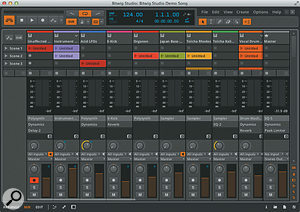 Bitwig sports a Browser Panel, which provides access to the usual variety of file-based resources: devices, presets, samples, clips and so on. The Browser Panel, showing devices and presets. The Devices view shows devices that are built-in or part of a Bitwig package alongside third-party VST plug-ins — note that there's no Audio Unit support on the Mac. For Bitwig devices, a lower sub-panel lists the available presets. A small preview sub-panel at the bottom provides a little more information about the selection, including whether third-party plug-ins are 32- or 64-bit: Bitwig will happily load and run both. VSTs are actually loaded into a separate 'sandbox', so that a misbehaving or crashing VST won't bring down the whole program. The views labelled Samples and Multisamples allow you to browse installed packages, or your own specified directories, for audio files or multisample setups. The Music view provides access to another set of directories categorised as 'music' as opposed to 'samples', the distinction apparently just for convenience. Clips browses individual clip files, and also seemed to pick up MIDI files, including in my case some I didn't even know I had, while Files provides a general-purpose heirarchical view of everything. As you would expect, audio files, presets, clips and so on can be dragged in either direction between a Browser view and the current project. The only information that wasn't immediately apparent is how clips are linked to their audio files. A Project Panel shows audio and plug-in files being used by the current project and allows audio files to be copied from their original location into a project, or located manually if for some reason they aren't found automatically. The machinery here isn't yet bullet-proof: while experimenting with the project directory layout I managed to 'lose' a set of sample files that were part of a Bitwig package, so it had no excuse not to be able to find them. 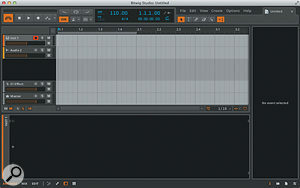 Bitwig Studio in Mix Layout, editing an audio clip. Bitwig's editing interface for audio and MIDI clips looks familiar, but has some subtleties and complexities which are worth exploring. 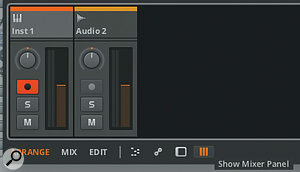 The screenshows Bitwig in its Mix Panel Layout, with Launcher clips plus mixer in the top centre panel and an audio clip selected in the lower panel. The Inspector Panel to the right is Bitwig's general 'get information' view, and in this case shows details about the selected clip. So far, so familiar: a closer look at the clip reveals transient markers just above the waveform (Bitwig calls them 'onsets'), some manually placed beat markers, which are akin to Live's warp markers, below, and locators for the clip's playback start, end and loop positions. For a closer look we could switch to the Edit Panel Layout, which would present the clip in the main top panel and let us hide everything else. The text buttons to the left of the waveform switch between different editing modes, accessing clip-level settings and a kind of automation that Bitwig refers to as 'expressions', and letting you work with audio fragments or modulation within the clip. The Stretch view lets us add, remove and shift the beat markers (or, as in Live, shift the audio underneath the markers), warping the audio playback to match sonic events against the beat. Onsets is an editing view for the onset markers, which can also be added, removed or shifted. Pitch, Pan and Gain provide access to a clip-level pitch-modification, audio panning and gain envelopes respectively. We should emphasise that these envelopes are not true automation in the usual sense, but are lower-level modulations applied to sections of a clip. This should become more apparent when we look at note editing, later. The Event editing mode will be new for Live users. While Live associates a single audio file with a clip, Bitwig allows a clip to contain multiple audio segments or 'events', so a single clip can be treated almost as a self-contained audio track in its own right. Audio events can be sliced, dragged and resized, allowing for fine-grained alterations or even radical changes. For instance, you can take a drum loop, slice it on beat divisions and then shuffle them around in time to create something completely new. The closest Live comes to this sort of feature is the ability to apply automation to the clip's playback position, which is not supported in Bitwig. A sliced-and-diced clip, with re-ordered, re-pitched and reversed audio events.Each audio event carries its own expression envelopes, so you can, for example, freely re-pitch events while rearranging them, as well as performing operations you'd normally associate with MIDI data, such as Reverse Pattern, which reverses the order of a sequence of notes in place. The screen, belowshows a single audio clip where I've dragged and duplicated some of the component events, added some pitch alterations, and also reversed the whole event sequence — and, for good measure, I've actually reversed the audio playback in a couple of the events as well. For the sake of completeness, we should mention that clips can also carry conventional automation, either in the form of MIDI controller data, or continuous data for device and mixer control in the track. Again, it's worth making a quick comparison with Live: in releases before Live 9, full automation was only supported at the complete track level in the Arrangement, while clips could carry envelope data to modify or offset the fixed or automated setting of a parameter. Live 9 brought proper, immediate automation to clips, while still supporting the relative envelope control, resulting in two separate but parallel control systems. Bitwig recognises the need for the different control modes, and offers clip automation in absolute form, linear offset (add/subtract) or multiplication (scale). The screenshot Editing a clip full-window: pitch expression (top) and send automation (bottom). 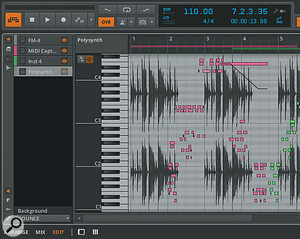 shows a clip being edited full-window, with a pitch expression envelope at the top and 'real' mix automation, in absolute mode (the highlighted 'A' button), below. The start, stop and loop points for automation can be 'free', meaning that they're decoupled from the corresponding points for audio playback; this setting is independent for each automated parameter. A minor niggle is that the automation start, end and loop points aren't shown in this particular view, though they are in the smaller edit panel. Although the clip is the natural unit of musical information, a clip rarely plays on its own. In the Arranger Timeline it might well be playing alongside other clips in other tracks, or in the Launcher it might be active with other clips in the same scene — or some other scene. Bitwig recognises the need to edit clips with reference to the other clips around them. In the screenshot to the below Editing two clips together in the same track., the editing panel is in track timeline mode, showing two clips on the same track, and providing the full set of editing operations on either, or both, of them. You can see gain expression envelopes running in both clips, and click back and forth between them freely. In fact, you can even drag audio events from one to the other, which is slightly disconcerting. An icon button in the left margin switches between this mode and the more familiar single-clip editing mode. When I was first experimenting with this, I was confused by the fact that a particular clip looked very different in the two views, until I realised that, correctly, the track-based view was unrolling the clip's loop, showing the iterations laid out in time, while the clip-based view was showing the full range of the clip's audio events plus the loop markers. This is in fact what Live does as well, but Live doesn't have this single-track editing view to cause any confusion. Switch to the Edit Panel Layout, and you can edit a single track full-screen, which is handy for those microscopic tweaks. 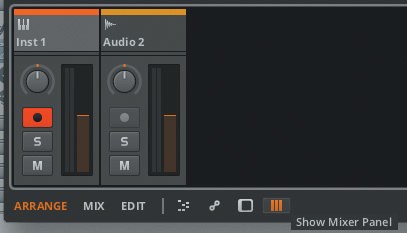 Bitwig also supports editing of multiple overlaid clips, a mode it refers to as layered editing. This can be done for audio clips, where the waveforms are stacked one above another, or for note clips, where the notes are overlaid on the same grid. Clips are aligned so that their left-hand boundaries coincide, regardless of where the clips are in the Arranger — they can even be in different parts of the same track. Launcher clips can also be layered, but a mix of Launcher and Arranger clips is not allowed. If the option to edit the track timeline (rather than individual clips) is enabled, then clips are forced to be shown in their correct timeline position — but, as compensation, you then get the option of editing note clips against an audio clip as a background reference. 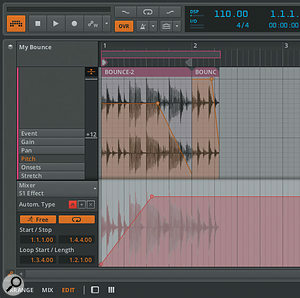 Bitwig comes bundled with a selection of its own devices, some of which we'll see shortly, and support for VST plug-ins. Devices are categorised as Note Effect (notes in and out), Audio Effect (audio in/out) and Instrument (notes in, audio out): so far, so famiiar. A little less familiar, perhaps, is the fact that Bitwig doesn't seem to care much about how effects and instruments are laid out in a track, in contrast to Live, which expects MIDI devices to live upstream of instruments and audio effects afterwards. The way it works is that note events and audio can potentially flow into, and out of, any kind of device. Although it may respond to MIDI modulation, an audio effect will ignore notes, passing them straight through, while a note effect will ignore audio. An instrument transforms notes into audio, replacing any upstream audio coming into it. 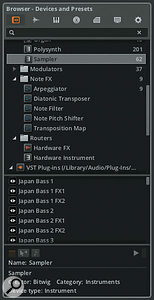 The only difference between instrument and audio tracks is the type of input they accept: notes and audio, respectively. A track will actually change type depending on the type of clips dropped into it, becoming a hybrid track if populated with both audio and note clips; any devices in the track are unaffected. All tracks produce audio, and there's no way to generate notes (or MIDI) as the output of a track. Let's look at VST plug-ins first. Drag a plug-in from the Browser into the Device Panel, and a generic control pane for the device appears. The parameters published by the plug-in are presented in a scrollable list; this has no facility to pick favourite parameters, although you can filter it to just show parameters which are automated or modulated. On the other hand, all device panels have a macro panel: each macro knob can be mapped to any selection of parameters with individual scaling. There's also a modulation panel, allowing up to eight parameters to be mapped to colour-coded inputs from one of Bitwig's supported MIDI controllers. Above the macro knobs are controls to save and restore preset states for the entire device, taggable by sound category and creator. Preset states can be dragged into your library for archiving or future use. And so to Bitwig's own devices. The selection included is reasonable,if not fantastically exciting. There's a decent choice of audio effects including filters, delays and dynamics processors. It's good to see a frequency shifter in the list; perhaps mercifully, there's no equivalent to Live's much over-used Beat Repeat delay effect. The instrument list is a little Spartan: alongside dedicated synth modules for drum sounds, there's a drawbar organ, an FM synth, an analogue-style polysynth and a multisampler. A note clip allows editing of pitches, velocities... and a few extras. The sampler supports full multisample editing with pitch and velocity switching, although there's nothing fancy like zone crossfading. All the instruments show their modulation sources and destinations clearly, the sources visible as horizontal arrows with 'bulbs' at their roots; monophonic sources like mod wheel and aftertouch highlight in blue, while polyphonic sources are shown in green. As well as internal generators like LFOs and envelopes, sequenced note timbre ('TMB') is also treated polyphonically, allowing envelope-based timbral change of individual notes over time. A couple of other kinds of device complete the selection on offer. The Containers include layering (such as the Drum Machine, offering a drum pad interface and hosting a distinct instrument chain for each note), as well as frequency and phase-based audio splitting into distinct effect chains, and two-dimensional trackpad-like containers for blending and modulating up to four instruments or effects. The Routers provide links to external MIDI and audio hardware. So much for the features: the key question is how they perform when you come to do some actual work with the program. My initial plan to assemble a 'mix tape' of previously recorded tracks as rehearsal material for a choreographic project was somewhat frustrated by the lack of a real-time ruler in the Arranger. (The header display does have a minute/second counter, which would do in a pinch.) The lack of Arranger-level fading and crossfading was also a drawback, as I would have had to resort to gain automation. 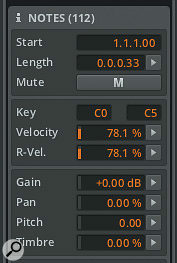 One nice feature of Bitwig's devices is that modulation is animated in real time in the interface. You can see envelopes triggering and decaying in the movement of the indicator rings around the parameter knobs, and the Polysynth even updates its waveform displays according to modulation or envelope input to the oscillators. The visual feedback almost made me feel that I was working with actual hardware. Needless to say, I had to play with polyphonic pitch control, gliding between various major and minor chords. While I wouldn't want to do this for dense musical passages, I was quite taken with the effect for long, ambient notes, especially in concert with other modulation. Overall, I was very impressed with the performance and stability of Bitwig, especially given that this is a version 1 release. It did occasionally drop out on mouse-clicks on my old and slow MacBook, but unless I was trying to use it over a networked screen connection from another machine, I found it to be basically uncrashable. Some of the click-and-drag response was a little glitchy, but I suspect that's fixable in future releases — or on a decent computer. I am always very wary of judging, or even describing, features described as 'forthcoming'. As far as I'm concerned, when it comes to music technology, if you can't buy it now or take it home, it doesn't exist. Having said that, Bitwig are trumpeting two features which are potentially significant. One is a modular audio and synthesis environment — the same one that's been used to build the factory devices, made available for anyone to create new instruments and effects — and the other is a facility to network multiple computers to collaborate on a single project, in real time. While you should never buy a product based on what the vendor says is coming up, it's worth being aware of where this particular DAW might be heading. 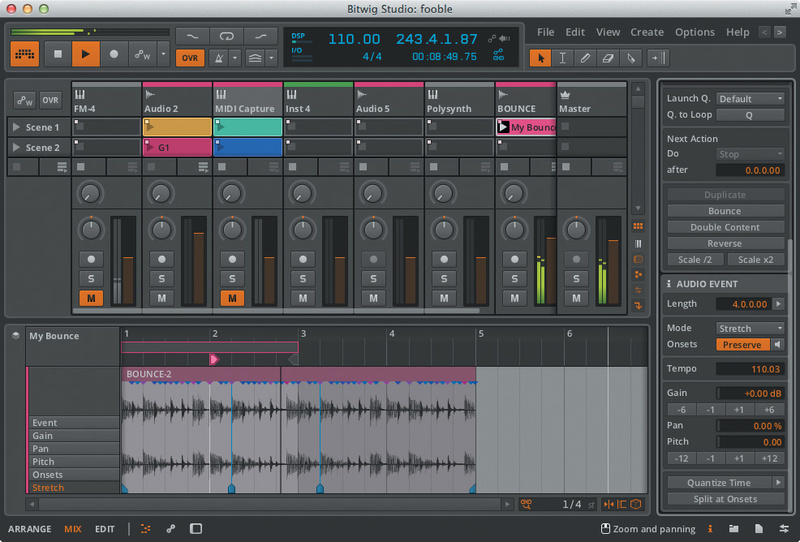 Overall, Bitwig Studio is an impressive first offering from a small startup company. It has a few rough edges, and a few holes in its feature set, to be expected from a version 1 release. As a long-time Ableton Live user, I initially found the roughness a little frustrating, but soon warmed to features like the multiple editing modes and versatile device configuration. Even if you don't feel a compelling need to jump to Bitwig in this early incarnation, it's certainly something to keep a close eye on. 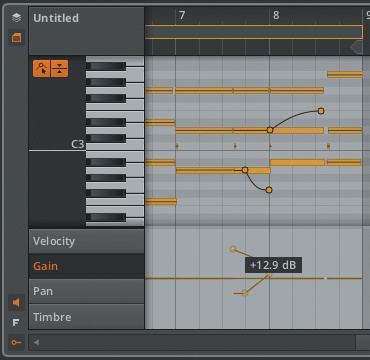 Bitwig Studio comes bundled with its own instruments, supports VST plug-ins, talks to MIDI controllers and sends MIDI to outboard devices, just like any sequencing package, but the manual uses the term 'MIDI' quite infrequently, and doesn't talk about 'MIDI clips' at all: the term 'Note Clip' is used instead. What's going on? Let's look at a MIDI — erm, 'note' — clip from the Bitwig demo song. The piano-roll display is conventional: time runs from left to right, and pitches are laid out vertically above a lower note-velocity display. A quick glance at the Inspector Panel shows velocity values as percentages rather than the usual MIDI range of 1 to 127, which is quirky but understandable. The Inspector also shows release velocities for notes, which is handy for those of us who still have ancient MIDI keyboards that respond to this. At the left of the velocity display, you can see the labels Gain, Pan and Timbre, suggesting that these can be applied to individual notes. As a habitual Ableton Live, Max/MSP and MIDI user, I found this to be unfamiliar territory, but it's very similar to the VST3 Note Expression machinery pioneered by Steinberg, which Cubase users have had for a while now. Bitwig's VST3 support is still forthcoming, but I've been informed that it will be compatible with the Note Expression features described here. Gain, pan and timbre have their own editing modes in the velocity area of the display, while note pitch expression can be edited on the piano roll. In the second screen, I've added a bit of gain automation to a couple of notes, and some pitch automation as well. The pitch control points can be snapped to semitones, so your chords can at least start and end in tune. While individual editing of note attributes might provide plenty of expressive power, it is likely to be a tedious process for any non-trivial quantity of music. 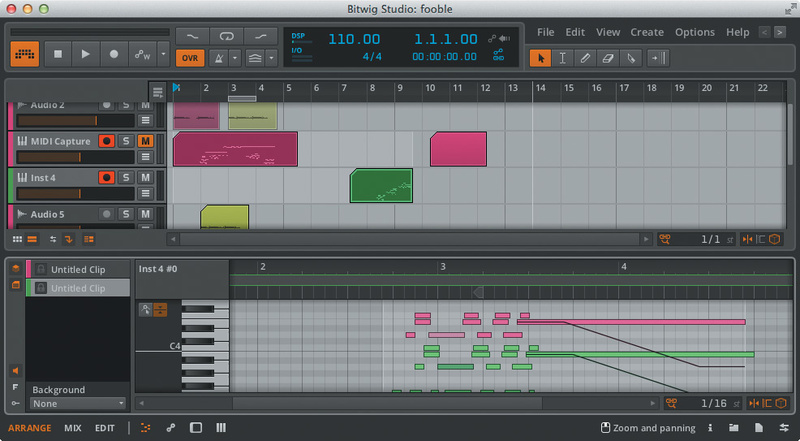 Bitwig provides some interesting tools for editing an entire selection of notes at once. When you select multiple notes, the inspector panel displays the average value of their velocity and other Note Expression parameters. Clicking and dragging any of these values, or double-clicking and typing in a new value, will offset the expression for all the selected notes, while clicking the right-arrow button beside a figure will bring up a graphical histogram display of all the values. From here you can change the spread of values around the current mean, or — for wilder results — apply some Chaos to randomly distribute values away from the mean. The histogram updates to show what you're doing, as does the note-editing panel. While random note detuning is likely to be of limited use outside the more experimental musical genres, I can see a use for slight variation in pan or timbre per note, or for that matter, giving each note its own wide pan position in the stereo field: unlike similar techniques for randomisation when programming synthesizer presets, these variations are sequenced, repeatable and editable. Histogram editing is, incidentally, also available for automation in general. However, given the polyphonic pitch control available through Note Expression, I was a little disappointed that there was no support for alternate tuning tables: there's no reason why the instruments couldn't support them. Perhaps that's in the pipeline for a future update. 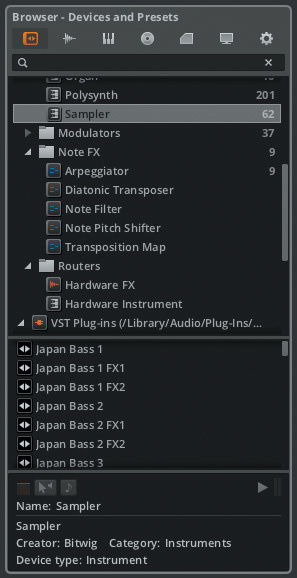 An interesting feature of many of the built-in Bitwig instruments and effects is their ability to host their own sub-effects. The Polysynth instrument panel has two drag-and-drop destinations to the far right labelled 'Note FX' and 'FX' allowing, in this case, note processors to be placed in front of the Polysynth and audio effects to be placed behind it. In this instance, the feature seems a little superfluous, as effects can always be placed around the instrument in the track itself, but in other cases, it allows more processing combinations. For example, the delay effects allow sub-effects to be placed into their feedback loops. (On discovering this, I immediately dropped the frequency shifter into a delay to make my own rather unconvincing Eventide Harmonizer.) Some of an instrument's modulation sources, such as LFOs, can even be targeted at parameters in the sub-effects; slightly disappointingly, but understandably, the modulators have to be monophonic, so this technique can't be used to gain envelope control over flange or distortion, for instance. Bitwig comes with some dedicated Modulator effects: there's an amplitude tracker, an LFO and a step sequencer. Each of these takes a hosted sub-effect and applies a modulation output to it. Experimentation suggests that modulators can be nested to some depth — they're colour-coded for clarity — and despite being labelled 'FX', the modulated device can even be an instrument. I can already imagine losing hours, if not days, exploring all of this. Alongside the bundled synth devices, Bitwig offers a set of sampled classic drum machines and acoustic drums, plus sampled Wurlitzer, marimba, vibraphone, basses, Clavinet, Rhodes, string machine and some oddities under the title WunderTuete. There are also 'teaser packs' from the likes of Beatport, Earth Moments, JoMoX, Raw Cutz, Sample Magic, the Loop Loft and Wave Alchemy. The selection on offer is, at this early stage, still a little weak; although Bitwig can obviously load and play samples without issue, there's no ecosystem of dedicated instrument racks and multisample setups of the kind available for Live, so for tailored Bitwig content you're currently restricted to what's available from Bitwig themselves. That might well have changed by the time you read this, though. Flexible and versatile screen layout. Parallel Launcher and Arranger clip views. Multiple audio fragments per clip. Polyphonic editing of note articulation. Versatile device configuration and control system. Support for 32- and 64-bit plug-ins, 'sandboxed' to prevent application crashes. Project management tools a little weak. MIDI routing is weak and, hence, there's no multi-channel VST support. Currently limited choice of tailored instruments and content. 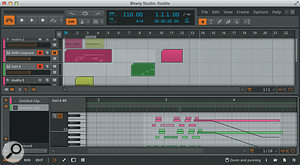 Bitwig Studio is a brand-new DAW, clearly influenced by the clip-based, audio-warping approach of Ableton Live. Though it has some early-release weaknesses, it also offers interesting takes on interface design, editing and device configuration. Apple 2010 MacBook Pro with 2.4GHz CPU and 4GB RAM, running Mac OS 10.9.2.